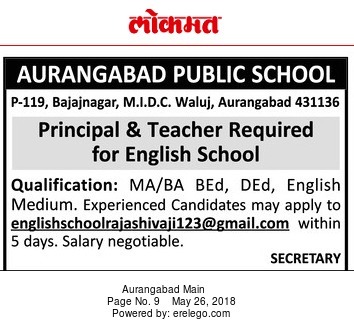 Aurangabad Public School, Aurangabad has advertised in local newspaper THE Lokmat for filling the posts of Principal, Teachers jobs vacancies. Interested and eligible job aspirants are requested to apply within 5 days .Check out further more details below. Detailed recruitment notification can be had at: Advertisement on THE Lokmat newspaper Dated 26th May 2018.